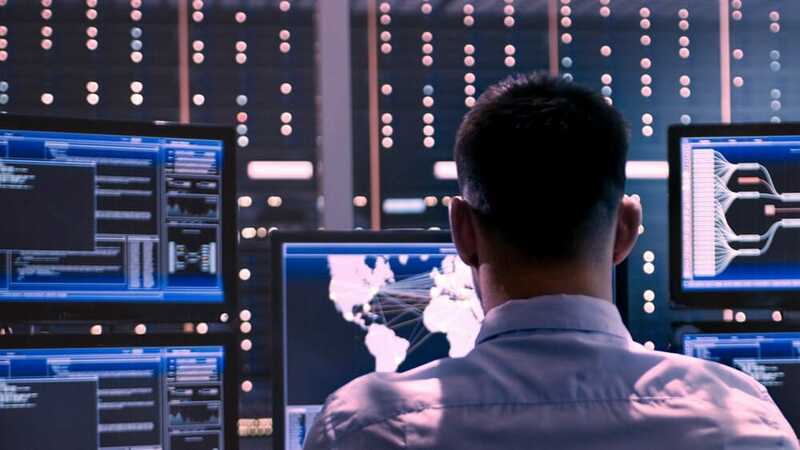 As businesses, governments and consumers rely on digital systems to fulfil most of their daily operations, so do the risks of those systems being hacked increase. The more the technologies they adopt, the greater the hazards they have to face. In fact, new solutions to ease businesses daily operations such as Artificial Intelligence in Operative Systems and IT software huge databases, bring even more complexity to an already convoluted world. However, these new techs can also become their strongest allies! If properly developed and embraced, they can deliver new layers of security that build up a strong shield of protection against hackers. 2018 was a dreadful year for cybersecurity. Governments, national institutions, businesses and customers all saw the results of several cyber breaches and attacks. Among all possible causes, investigators found that the systems they were working with were outdated and lacked improved, properly designed protection. The problem was not the digital systems in themselves. On the contrary, these allowed for better and faster communications between transversal entities in creative and remote ways. The main issue laid on their security systems. The old-school compliance mandates per vertical – FISMA for financials, HIPAA for healthcare etc. aren’t secure anymore, as it has been seen along these years. These outdated mandates will end up disappearing sooner than later. Along the same line, other traditional concepts will also disappear in the near future, such as perimeter security, storage-only encryption, access control based on privilege records, authentication that relies on one strong factor or the controversial DMZ zone. These old, almost archaic, security protocols, will soon give way to new methods of security, more advanced and even capable of learning. Two new technologies , in fact, are the ones that as per their own structure and usage, are meant to be perfect to implement a better cybersecurity. This can be achieved, just by embedding them in any IT system. We are talking about AI and blockchain, two rather new technologies that are reshaping the current landscape of computing. These two technologies are seen as techniques within the IT industry rather than security protocols per se because they are built upon the strongest security measures, and hence can become a shield just by adopting them. “Many new techniques will arise through machine learning and weak AIs, especially in intrusion detection and making sense of large-scale monitoring and signal analysis. Many new techniques will arise from advancements in [blockchain platforms] cryptography and collective effort to eliminate poor cryptography. Still, we will have snake-oil products and systems,” says Eugene Pilyankevich, CTO at Cossack Labs, a specialized security company, experimenting with ways in which machine learning capabilities and blockchain can disrupt the way security is understood. These 2 technologies present different characteristics according to their own nature. AI solutions can be applied to produce a learning security behaviour capable of detecting and eliminating threats, just like humans do, but thousands of time faster. Blockchain, on the other hand, leverages a secure and highly encrypted digital ledger platform, only accessible by authorized peers. Artificial Intelligence nowadays has been inserted in what is now called as Intelligent Security solutions. These are protocols, software or even raw code, that is added to the IT system of a company or institution. AI, then, adds another layer of security capable of learning from threats, security breaches and other data collected through their mechanisms. By combining aspects of machine learning and artificial intelligence with traditional security applications, Intelligent Security Solutions, are more capable of adapting to new threats and to secure new types of applications. Basically, this system is based on AI algorithms that are able to learn from security breaches to avoid them in the future. Consequently, the more attacks a system is hit with, the more reliable the security will be to defend itself in the future. Other solutions using AI besides service resilience, include threat detection with many startups working on that line such as Darktrace; response automation, with Fortinet as example; endpoint protection software (such as the one developed by CrowdStrike or Risk-Based Authentication (RBA) with BioCatch or Centrify as some of its representatives. 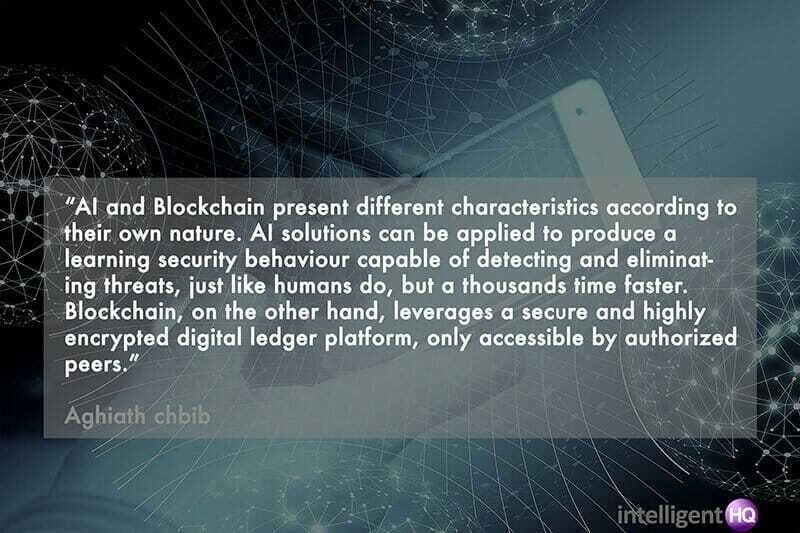 One of the main characteristics of blockchain technology is that it is actually secure per se, thus allowing for AI code to be inserted within its platform. This distributed ledger is built and written bearing in mind the goal of securely storing millions of data within its platform, leveraging a series of architecture tweaks for it. It is conceived, through its proof of work protocol, that implies that every person part of the blockchain, accounts for all the changes made in the chain, so all modifications have to be approved. Likewise, this system allows for a trustless principle where all transactions are anonymous, but they stay recorded in the chain and a ID will be storage. All of these measures go towards keeping the integrity of data. Simply put, blockchain is the next step within databases development. A blockchain platform is formed out of infinite blocks, every time a block is solved, the platform itself will create a new block carrying along a “hash”, or fingerprint from the previous block. One of the main characteristics that makes blockchain highly secure it is its decentralized nature: “What is used to secure the authentication of the source of the transaction is cryptography, through the hash codes. There is never a duplicate recording of the same transaction. As such, the need for a central intermediary is not there any more. This breaks with the paradigm of centralised consensus ( when one central database is used to rule transaction validity),” recently said blockchain expert Dinis Guarda. Also, blockchain platforms use two type of consensus among all members called proof of stake and proof of work to validate any changes make on any given block amid asking users to prove ownership. Proof of stake (PoS) is a method by which a blockchain network aims to achieve distributed consensus. Proof of work (PoW) method on the other hand, asks users to repeatedly run hashing algorithms or other client puzzles to validate electronic transactions. Both ways are thought upon leveraging that any change made on the blockchain is generally validated among all users, hence making the blockchain intruders-free as any external change will be watched by hundreds if not thousands of users. Nonetheless, the characteristic that most cybersecurity experts have laid their eyes on is the possibility of building smart contracts within a blockchain platform. Smart contracts not only define the rules and penalties around an agreement in the same way that a traditional contract does, but also automatically enforce those obligations for all parts. Smart contracts terms are recorded in a computer language instead of legal language. 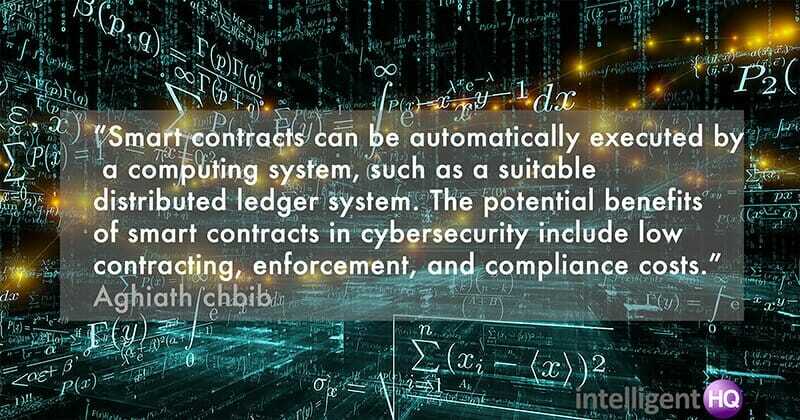 Smart contracts can be automatically executed by a computing system, such as a suitable distributed ledger system. The potential benefits of smart contracts include low contracting, enforcement, and compliance costs; consequently it becomes securely viable to form contracts over numerous low-value transactions. Some of the companies that have raised quite an impressive amount of funds for their blockchain security platforms are NuCypher, Acronis as well as IBM blockchain platform or Facebook among others. The widely adoption of digital technologies in our daily lives means greater perils for which most of us are underprepared. We have adopted behaviours to protect ourselves in the analogue world throughout years of evolution, which has worked just fine until now. In the digital, nonetheless, we are still falling behind, either because of the complexity of current IT systems, lack of literacy or the remoteness of a blurred risk hitting us directly. However they reason may be, cybersecurity is nothing less important than the safety measures we would take in real life to keep well guarded what rightfully belongs to us. Identity, money or private information are all critical data susceptible of being hacked, though the shields we have set up between them and us are fragile and weak, to say the least. AI and blockchain are born out of human behaviours that have worked in the past, prediction, responsiveness and validation, which makes them two of the most promising security measures for the near future. 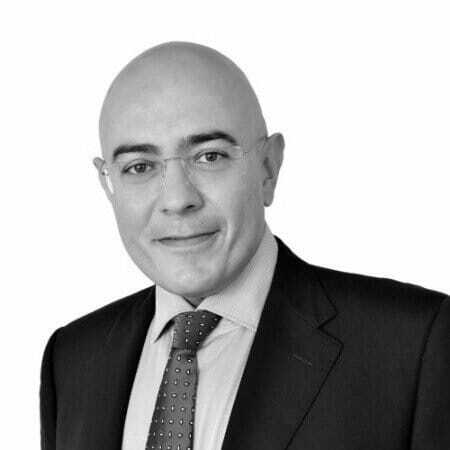 Aghiath Chbib – Established executive with close to 2 decades of proven successes driving business development and Sales across Europe, Middle East, and North Africa. Expert knowledge of cybersecurity, lawful inceptions, digital forensics, blockchain, data protection, data, and voice encryptions, and data center. Detail-oriented, diplomatic, highly-ethical thought leader and change agent equipped with the ability to close multi-million-dollar projects allowing for rapid market expansion. Business-minded professional adept at cultivating and maintaining strategic relationships with senior government officials, business leaders, and stakeholders. Passionate entrepreneur with an extensive professional network comprised of hundreds of customers with access to major security system integrators and resellers.